I know, I know, I know… I've already expressed I'd give Sebastian Barry the Booker for his handsomeness alone, but never mind that. I received On Canaan's Side today, ripped open the box and started it immediately. Never mind, you others! Sebastian Barry is here. "… But I was able to sit down here at the kitchen table, the Formica beaming the sun on into the hallway behind me, like a great flat stone of light bounced on the sea. And be thinking, remembering. Trying to. All difficult dark stuff, stories stuffed away, like old socks into old pillowcases. Not quite knowing the weight of truth in them much any more. And things that I have let be a long time, in the interests of happiness, or at least that daily contentment that I was once I do believe the mistress of. The pleasure in something cooked right, just the small and strangely infinite pleasure to be had from seeing, from witnessing, a tray of freshly baked biscuits. Like I had just completed the Parthenon, or carved Jefferson into a rockface, or maybe the contentment, the very sinews, of the bear when he digs a salmon out of the water with his paw. Mightily healing, deeply, and what else could we have come here for except to sense these tiny victories? Not the big victories that crush and kill the victor. Not wars and civil ructions, but the saving grace of Hollandaise sauce that has escaped all the possibilities of culinary disaster and is being spread like a yellow prayer on a plump cod steak – victoriously." This is perfection. It gets no better than this – gives me the shivers. Do I dare call the Booker already? It's taking everything I have not to. He's been shortlisted twice. It's time he's given his due. I haven't even finished the book yet! Not even halfway through. I'll be dissolved into a pool of tears before I'm done, at this rate. I'm marking all over every page, highlighting all the beautiful words and phrases. Hardly anything is left white. My nerves will be shattered between now and the shortlist, from then 'til the announcement of the winner. It's painful! S.S., my prodigal blogging friend! 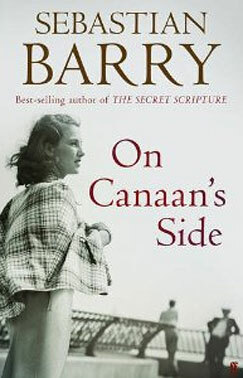 You must, MUST read Sebastian Barry. Perfection! Sheer perfection. He’s won the Costa and the next natural step is the Booker. Do give him a try!